Trieu, as it turns out, is no stranger to the restaurant business. He told me he was one of the co-founders of Bellevue’s Vietnamese pho house What the Pho! (Which, by the way, is exactly what I said when I saw that yellow banner hanging at Made in Kitchen.) 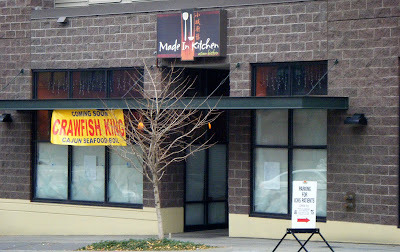 What the Pho now has a location in Bothell, and another one soon to open in Southcenter. 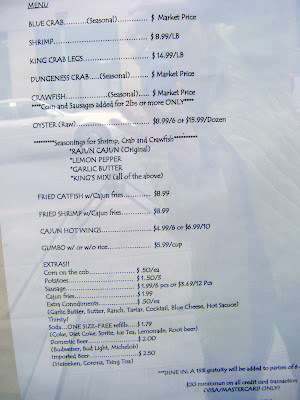 When I asked, “What’s a nice Vietnamese guy like you doing opening a Cajun joint in Seattle’s Chinatown International District?” Trieu didn’t miss a beat before waxing rhapsodic about his frequent trips to Texas to visit his cousin James Nguyen — the owner of Crawfish King. Fresh, seasonal seafood — including the Louisiana crawfish he’ll be flying in daily via Southwest Airlines — will be the star of the show. 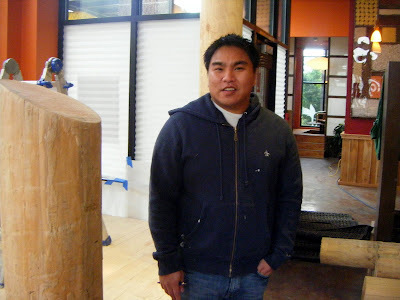 But Trieu also plans to import blue crab from the Gulf Coast and sell fresh Dungeness crab, oysters, clams and shrimp from right here in the Pacific Northwest. Sounds great, doesn’t it?